•	100% waterproof. Welded seams make these overgloves 100% waterproof. They simply can't leak! •	Up to 50% warmer. They make excellent windbreakers keeping M/C gloves at higher air temperatures. Great for extra warmth in fine cold weather. •	Light weight: Made from strong flexible polyester. Minimal loss of feeling in fingers if any. •	Last longer: Your leather gloves will last longer with no exposure to wet weather. •	Pack up small: Rolled up, these overgloves come in a pocket sized pouch. •	More wet weather riding: You'll do more wet weather riding now the most difficult part of the body to keep comfortable in wet weather riding is warm & dry. 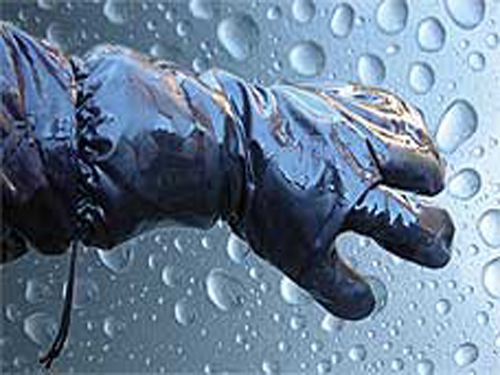 •	Rain-Offs are made with elastic and toggle buttons to pull the gauntlets tight against the arm keeping the wet from running into your gloves. •	Gauntlet: Designed with gauntlets to cover the longest gloves. Therefore keeping cold wind & rain from entering up sleeves. •	More economical than spending $'s on expensive (and possibly) waterproof gloves. •	Visor friendly: You can wipe your visor absolutely clear with no scratching or annoying smearing and smudging. IMPORTANT: Below is a basic guide. 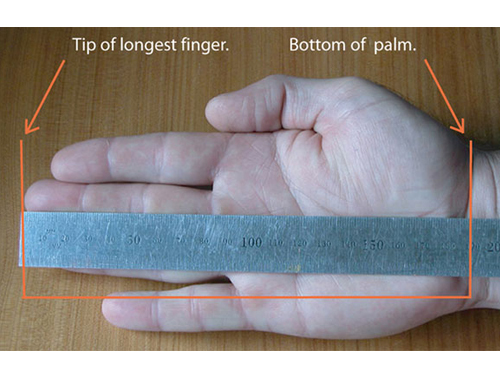 *Some riders have huge hands and long fingers, if this sounds like you please use the image below as a guide to measure your hand.